Who could resist a box full of dragons? Obviously not me, which is why I've got a set of the new Dragon Oracle Cards by Diana Cooper, with artwork by Carla Lee Morrow. Dragons are fantastic beasts that have symbolised many different things to people from a wide range of cultures throughout history. Over time they have been depicted as gods, monsters, guardians, elemental beings and spiritual allies. Diana Cooper firmly places them in the helpful category rather than seeing them as forces of greed and destruction that burn down cities unless appeased by gifts of fair maidens or slain by knights errant. In the book that comes with the boxed set, Diana Cooper says: "Dragons are beautiful, wise, open-hearted etheric beings of the angelic realms who are sent here by the Source to assist us... They operate on a different vibrational frequency to us, which is why most people can’t see them, but they are very willing to connect with us if we are ready to tune in to their wavelength. Dragons really love the planet and everyone on it, and are pouring into Earth now to help us with the transition to the new Golden Age." 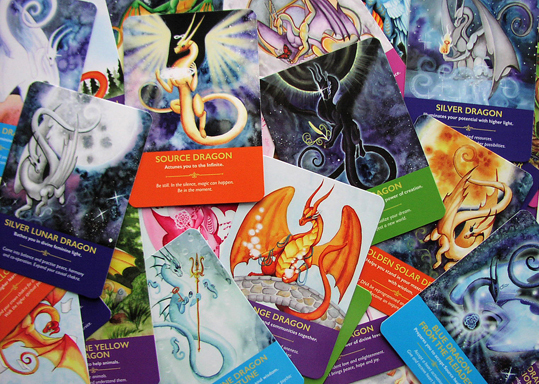 If that view of dragons appeals to you, then you can use this deck to ask their assistance in answering questions about issues in your daily life, about your "soul mission" or about helping the planet in general. As with most oracle decks, you can pick one card for a quick answer, three cards to represent the past, present and future, or do a more complicated spread. The cards are good quality and come in a sturdy box with full instructions in a booklet. The set is published by Hay House. You can view the Dragon Oracle Cards on Amazon.